I sure do love that I have the ability and the privilege to stay home and raise my baby. It is something I cherish very much and try very hard to never take for granted. But, as much as I love my 19-month-old, it can get easy to suffer from cabin fever after being cooped up in our home when it’s too hot, too cold, or too wet to get outside. Exploring the great outdoors with my son is so important to me. And although we have a great backyard, I want him to see the bigger scale — our backyard in East Tennessee! I’ve discovered a perfect stress release… It involves hitting the hiking trail with my son on my back and my 2 dogs by my side. Of course, I love the days that my husband can join us on his days off from work or a fellow mama friend with her little one. Want to know how I find hiking trails that are toddler-friendly? I use the All Trails app. 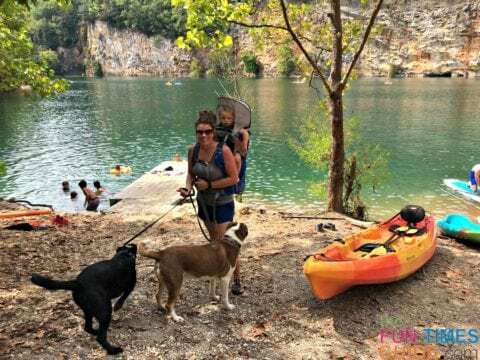 I’ve found it’s the best way to find good places for easy hikes which are also dog-friendly. This app has been a tremendous help in discovering amazing waterfalls and hiking trails nearby. 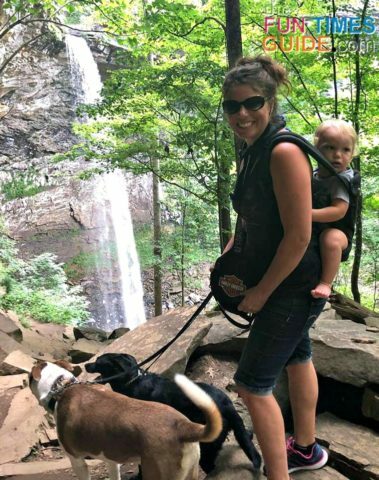 Even though we live in the gateway to the Great Smoky Mountains, most epic hiking places require a 45-minute (or more) travel time in the car to get there. I do have access to an amazing series of faithful trails only 15 minutes from my house — and that’s always our go-to when we don’t have a lot of time to commit to an outdoor adventure. But I find myself using the All Trails app more and more lately whenever I’m hiking with baby. The app has a wonderful way to search trails or destinations via the map or list feature. I usually select the area on the map that I wish to explore first. Then, I view the list — because I can preview pictures and reviews of the trail from actual hikers who’ve been there. I can also check into a particular trail myself and add my own pictures and reviews. Even though the All Trails app is super helpful, we really never know what exactly we are getting into until we get there and experience it for ourselves. I’m always prepared for a hit or miss — and I just always accept it as part of the adventure. 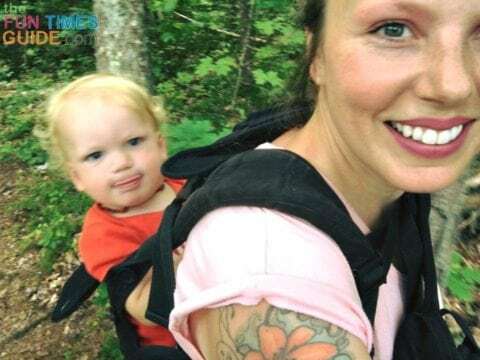 #1 – Save your shoulders and back from strain by getting a hiking baby carrier. Do a dry run carrying your baby/toddler in a baby backpack carrier at home first — to get your baby familiar with being carried in the pack. Plus, you will want to ensure that your child carrier is set up perfectly for you and your baby before you hit the trail. Don’t worry… technology has come a long way! The current hiking carriers provide maximum comfort for you and baby with proper weight distribution. 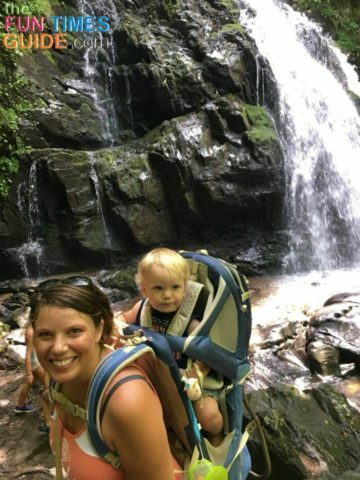 Another reason that I like using a hiking baby carrier is because I can pack baby and all of our items in one pack! It’s super handy. As far as which hiking baby carrier is best… I’ve tried a Kelty Pathfinder 3.0 child carrier. But I currently use the Osprey Poco AG Plus child carrier. Here’s my review of the Osprey hiking baby backpack vs. the Kelty baby hiking carrier. 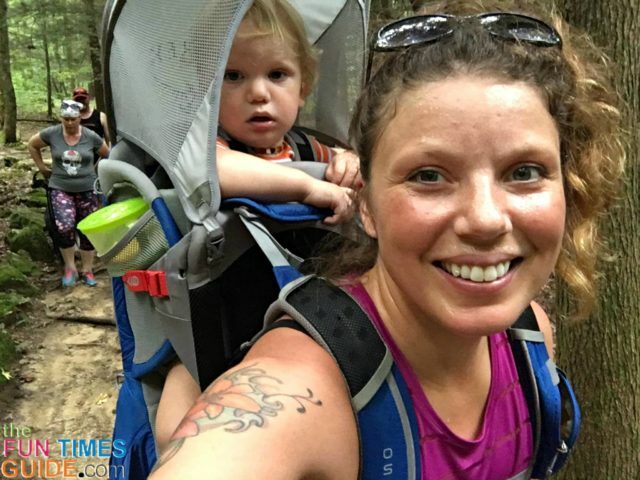 #2 – Be realistic about your ability to hike while carrying the weight of your baby… and all the gear. I always think I want to do an epic, long hike while carrying my almost 30lb, 19-month-old. But I’m almost instantly reminded of my limitations once I hit the terrain… or the Tennessee heat! I try to find out as much as I can about the trail ahead of time — to familiarize myself with the trail, and so I can prepare mentally for what to expect. I like to read the reviews to find out what the terrain is like, and sometimes I can get a good idea of how long the hike will actually take. I always let my husband know where we are going and check in with him as often as I can whenever I’m out on the trails hiking with baby. I cannot stress enough the importance of choosing a trail with the appropriate distance and terrain for your baby! You won’t know what the magic combination is until you get out there and try though. I can speak from experience on this… it is never a fun time dealing with an unhappy hiker. #3 – Pack (or wear) swimwear or fast-drying clothes. East Tennessee has lots of water, heat, and humidity! So when we discover little creeks or swimming holes, we don’t hesitate to wade right in to get a refreshing break from the heat. I find it’s easiest to do this when you’re wearing fast-drying clothes — rather than having to find a place to change clothes. #4 – Plan the timing of your hike wisely. I’ve had a couple blunders where my son would fall asleep in the car right before we were about to unload and hit the trailhead. Sometimes it’s inevitable — if you need to travel to get to where you want to hike. I’ve found it is usually the most enjoyable experience when my son is fully rested before we hit the trail. Plus, if we hit the trail early enough, the dogs and I can get some exercise while my son gets some fresh air and a cool sensory experience. This tends to be the perfect combination for timing that my son will fall asleep in the car on the way home and be well-rested by the time we get home! #5 – Take your time and enjoy the fresh air. I tend to get focused on completing a trail and counting the mileage. But I’ve found that my son likes his rest stops. I need to keep reminding myself that my son tires easily while riding in his carrier — so it’s important to plan to stop and explore more when hiking with baby. At the very least, I like to choose a spot about halfway into the hike to either swim or recharge with snacks and water. #6 – Pack light with just a little of each of the essentials. I try to pack the bare minimum of all the essentials — because once I add my son, drinking water, the weight of the pack, plus any essentials, the weight load can really start to add up! #7 – Keep baby entertained while on your back. I try to make hiking fun for my son. I also like to make hiking educational and a fun sensory activity for him. I will hand him pine cones, branches, and other natural artifacts along the way to keep him entertained. I also like to point to and name trees or flowers and let him touch branches to keep him engaged while we’re hiking. #8 – Wear sun protection. It’s best to apply sunscreen and bug spray before you hit the trail — so you don’t have to pack it. It is still important to keep baby protected from the sun (or inclement weather) with a sun hat though. Or use the built-in sun shade on your hiking baby carrier. So far, my experience hiking with baby has been quite enjoyable! It is a lot of work carrying my son, but I remind myself to enjoy it because I won’t be carrying him much longer. He is not fully walking yet — but he’s very close. For now, he’s comfortable being toted around. However, I’m not sure how far we will be able to hike once he fully discovers his independence by walking on his own. He may not want to be carried anymore and prefer to walk part of the trail on his own. I’m certainly hoping he will still like to go exploring with his MaMa. But at the very least, I’m happy we at least got the process started with a good hiking baby carrier that met our needs during the toddler phase. For me, it becomes rather addictive to seek out the next place to go hiking. And it’s so much more special with each new trail or destination being the first for both of us to explore. We will continue our adventures as long as we are able — because there are an infinite number of trails and waterfalls yet to be experienced together. I highly recommend starting the love of nature early with your baby! Start small and set yourself up for success by making sure that you and your baby are comfortable and the weather is appropriate. You will discover what your essentials are to pack by hitting the trail and seeing what works for your style of hiking.